I rarely switch up my skincare routine. I've found something that works perfectly for me so introducing a new product means they've got to be pretty good. In July, I picked up the Tatcha Luminous Dewy Skin Mist (aka the most expensive mist in the entire world...), and I've been using it ever since. I've seen most people use it in their makeup routine, but I've been using mine in the evenings after moisturiser to give my skin an extra moisture boost - plus it smells absolutely divine and so relaxing. It also helps that the scent is completely natural, and there are no synthetic fragrances in this - making it good for more sensitive skin. It also contains glycerin, which is why people often use it before makeup (glycerin acts as a glue for the skin, and helps anything you put on top adhere to the skin better). Other key ingredients include Squalane - this is a natural moisturiser produced by the body, but deteriorates after the age of 30, so including a product with squalane in can help to restore the body's natural oils. It also has anti-bacterial properties so helps with acne. The other key ingredient is Red Algae, which helps with the skin's water-retention (therefore helping with moisturising even more!). I can't say that it's worth the £££, but if you fancy some luxury in your routine, you can't get much more luxurious than this - plus the ingredients speak for themselves, if you're in need of moisture, this is where to go! 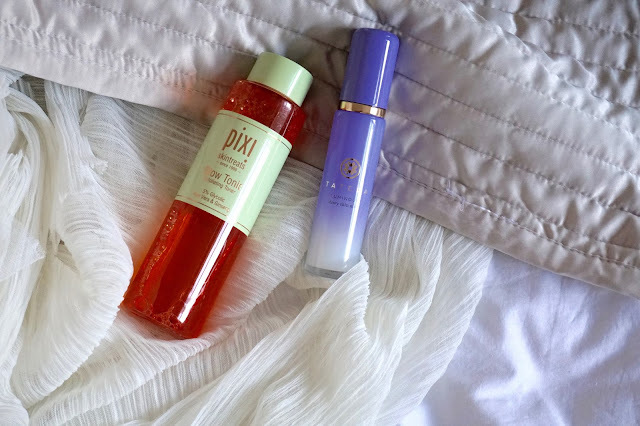 Next up is the cult Pixi Glow Tonic. I was having a skin crisis back in July - makeup wasn't sitting on my skin right, and after my holiday it was just not having a good time. So, I caved and got the Glow Tonic from Pixi, just to see what all the fuss was about. I have to say, I've not been disappointed with this one. It's a great post-cleanse toner - I use it in the evenings only so it doesn't strip my skin too much. It's alcohol free (so no drying out your skin!) and contains glycolic acid (which is what makes your skin so glowy!). Now for the science bit - glycolic acid has the smallest molecules in the group of AHAs so it can penetrate the skin deeply and easily, therefore making it the most effective for treating a number of skincare problems, like fine lines, dullness, oiliness and acne. It helps to chemically exfoliate the skin to get rid of dead skin cells, paving the way for fresh, glowy skin! I honestly absolutely love it, and learning about what all the ingredients do for your skin is a great way to decide if a product is for you or not. I love glowing skin, so this was easily going to make it into my skincare routine at one point!